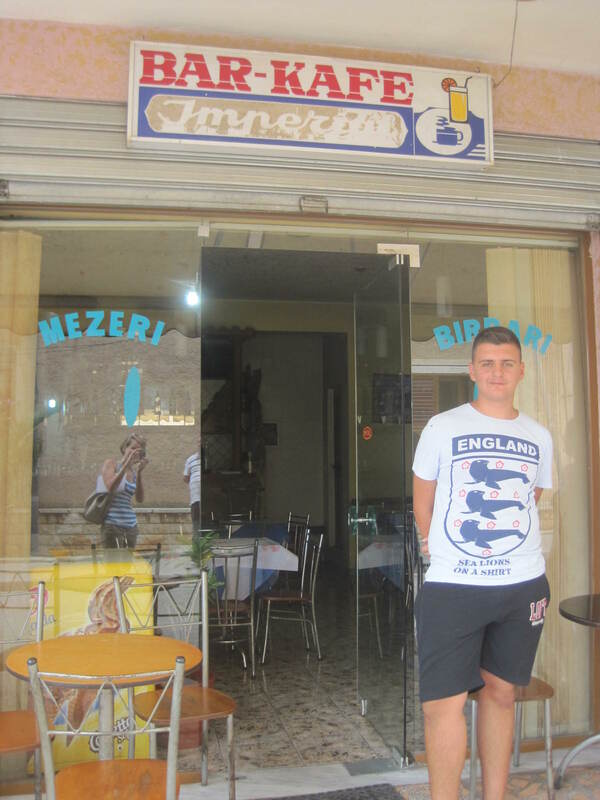 Three years in Albania in the Saranda area I’ve come to be a regular at a couple of local eateries. Below are some of my main recommendations for visitors, they’re not all quite what you would expect. I was a true local for a while here and the places that attracted me weren’t only the numerous awesome seafood restaurants of Saranda but also the very local hole in the walls for not only the food, but also for the people. A fast food place, All Day Grill, has on it’s menu all that one expects of a fast food lokal in Albania- shredded lamb sufllaqe/gyro, fries, xaxiki (sour cream with cucumbers), etc. It recently added to it’s menu pizzas, after hiring the workers of a pizza place that had gone under. Subsequently, it started to receive my business on a very regular basis. I became a major frequenter for their pepperoni and Mexican pizzas. They are the most authentic versions of such that I have found in Albania. Paired with a draft beer, you’ve got a great meal. Located on the seaside promenade (shetitore), it is now on the point of the walking street where one walks down stairs to pass around a grouping of buildings. 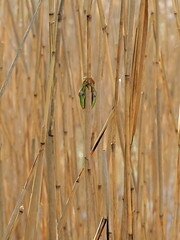 Check out this photos to orient yourself. The outdoor seating provides customers with a grand view of both the seaside and the promenade for delightful people watching. Get there at the beginning of the xhiro (literally translated to ‘turn’, as in ‘to take a turn around the neighborhood’) around 6:30/7 pm and it’s what I jokingly refer to as ‘Baby Time’. One clearly sees the high turnover population of Albania at this time, as families escape their concrete homes that have been warmed by the sun all day, for the cooler breezes along the shore and socializing with their fellow residents. Being an American, I appreciate this so much as we are a stay-in-your-home-or-behind-your-high-fenced-backyard-type of people. I digress, All Day Grill is good pizza at a great price, with companionable customer service. A personal interest of mine was also to support my friend Tani Çeliku’s, owner of Tani’s Bar & Guesthouse, sister Juli & her husband Arti Caka. The Çeliku’s have been supportive of me throughout my Peace Corps service. A family business indeed, with little Keisi (I’m Casey/Keisi too, we had a fun time with that, ‘Hej Kejsi i vogel’, ‘Hej Kejsi i madhe’, little/big.) & Kristian, their kids, running around and many other families enjoying a dinner out together here. Easily the best known restaurant in Saranda, Limani’s or Baçi’s, as it’s known by the locals, this is a great restaurant for a variety of desires. 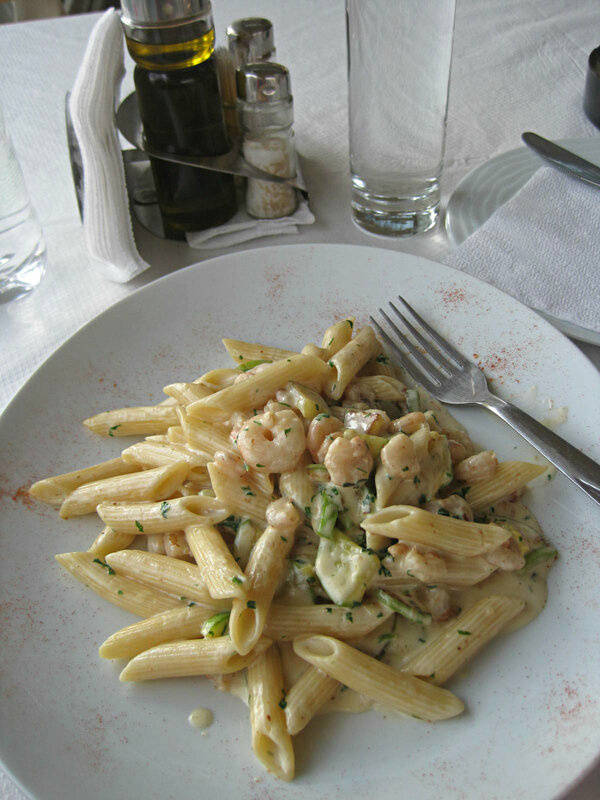 Pictured is my favorite dish, penne pasta with shrimp and zucchini, but filter coffee, mixed seafood platters and pastas, arugula salad (entertainingly translated into British English, which is ‘rocket’), chef salad with dressing on the side and even the soft serve ice cream were other items on their menu I frequented. To my personal taste, better pizza can be found at the next suggestion but it is a popular option for others. The food is quite equivalent to the prices. Order a couple of plates to share with friends and you may end up with extra for leftovers. The waiters were quite used to seeing me, as I also frequented the location to sit and work on it’s free wifi with a coffee, wine or Sprite. Not to be overlooked is the owner’s, Baçi, steadfast support of the Saranda Children’s Home for special events for the children’s birthday, providing gifts at Christmas/New Years, and the owner’s family’s sponsorship of the children; which alone would be enough for me to want to continue supporting this business. The cherry on top, Limani’s is located directly on the seaside with a beautiful glass faced covered outdoor-like area. The indoors is warm and cozy for chilly winter day working. 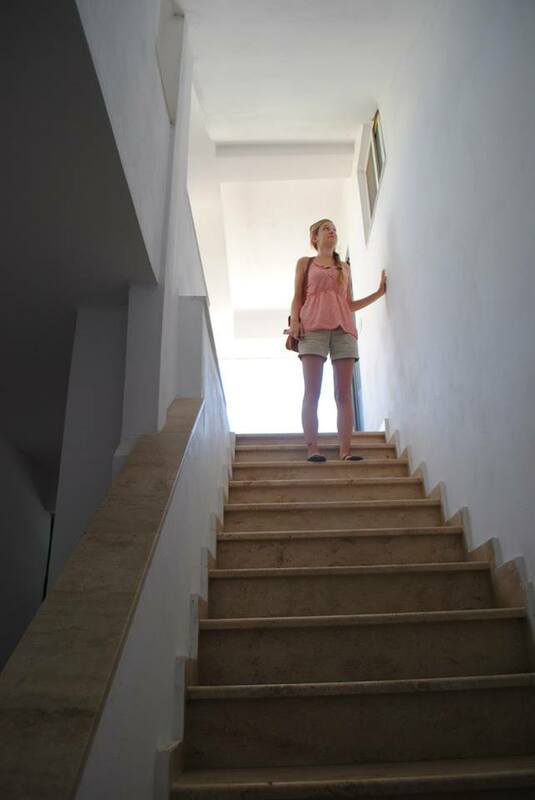 Plus you can continue further to the seaside from the restaurant to the only coffee area, be right on the sea (pa/without railing) and enjoy a full panorama of the open Ionian sea gulf. The ambiance of the area is very inviting for all types of persons from tourists to locals, from romantic dates to group events. 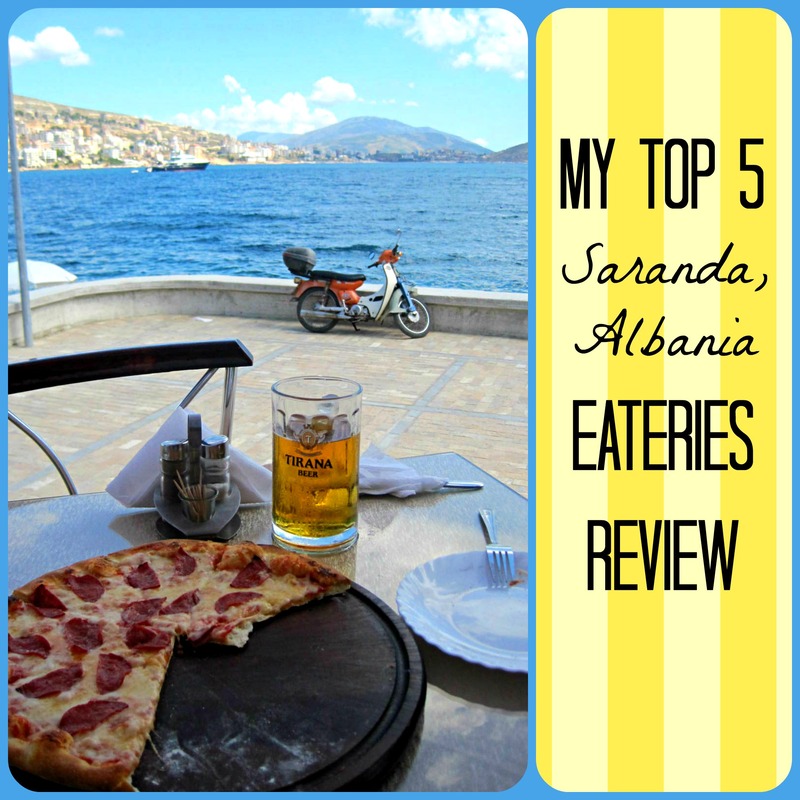 I’ve experienced all of the above, and it’s my choice suggestion for eating out in Saranda. Speaking of escaping your home to cool off during a xhiro, Kayak is my number one pick for a scoop of ice cream. A variety of flavors to choose from, the owner makes it all himself, such as dark chocolate, cookies, melon, coconut, pistachio, and strawberry; just to name a few of my favorites. 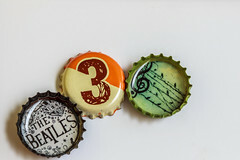 Take your time and try a couple of samples, they won’t rush you. It’s 50 lek (~$.50) a scoop, so why not get a couple? It’s well located right by Limani’s or down the road from All Day Grill, the bright color and well established sign make it hard to miss. Plus, there’s a cute little painting of Despicable Me characters on the side of the building, which I appreciate for it’s creative uniqueness in a country that doesn’t cultivate graffiti or mural artwork quite enough, in my opinion. 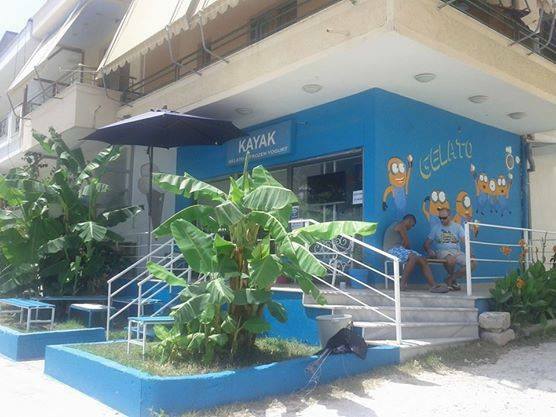 The owner, Harris Mpousios, named the establishment for his hobby of kayaking which he did frequently living in Greece. Some of the most forward thinking people I’ve met in this country are those that have lived abroad. They return with fresh ideas and inspiration, furthering the future of Albania and it’s competitiveness in the tourism market. Simple ideas like murals make a big difference in attracting foreign customers and this establishments plays directly upon this concept. Being a form of an artist, I, for one, was drawn like a moth to its turquoise flame. For further specificity, I have given this restaurant the name, ‘Bus Stop Place’ due to its approximation to the ‘Second Bus Station’ (hm.. duh). There are two locations for buses, along the same road in the center of Saranda. This restaurant is located at the upper, higher located “Second Bus Station’, where buses are for locations like Permet, Berat, Lushnje, & Cerrik; generally I think of this bus station as the one for locations outside of Tirana, however, one later afternoon furgon (large van) goes at 4 pm to the capital, arriving at about 9 pm. The other station, is the ‘Main Bus Station’ where people can find the large buses that leave in the morning until 2 pm to Tirana, and one or two buses that go up the Bregdeti/seaside road to places like Himarë, Dhermi/Drymades, & Vlorë. The ‘main bus station’ thankfully has an office where I highly suggest getting your tickets if you’re a tourist, you won’t get taken advantage at the office, but you never know on the bus. For those unfamiliar with the bus system, taking a bus to Tirana means that you are traversing the main autostrad to the capital, and can jump out at any place along the route, such as Gjirokastër, Memaliaj, Fier, Rrogozhinë, Kavajë, etc. If you’re really savy, you know that instead of taking a direct bus from the ‘higher located bus station’ also that if you get off at certain points along this route, it’s an easy place to wait to grab something going quicker to Vlorë or Berat; or it could be the only way to directly connect with other places like Patos, Elbasan & Durrës. Confused? Well I can elaborate further if you leave me some comments on this post. However, my main point with the ‘Bus Stop Place’, as I have so coined it, is that this is a great place to chill out to wait for your bus to go. Grab a beer or a raki and chat away with the locals or bus drivers, if you can, who are the main patrons of the establishment. The gem of this place are the very helpful couple running the establishment. For the life of me I can not recall their names, but with a kind word and a purchase (or not) they will help you with most anything. They have voiced to me repeatedly their deep respect for the Peace Corps and foreigners and I believe it with the number of coffees they haven’t let me pay for. They have the phone numbers for most of the bus drivers and can call ahead to reserve spots, which on some is a really good idea, such as the 4 pm to Tirana furgon. In any case, it’s good to support businesses that are understandable and polite to foreigners, not seeing them as a burden on their lives but as people coming to enjoy and respect their country and culture. I believe this couple is a good personification of the traditional hospitality towards guest that historically was paramount in Albanian culture. My last suggestion, is for a true hole in the wall place. Located on an alley across from the basketball courts, are the best directions I can give. Chicken shack is what I refer to this place as, and true to the name, this is what I’d suggest getting. For only 500 lek/$5 you can get a whole roasted chicken, maybe also sit and enjoy a beer on the little outdoor tables with some patate/fries. “Pula te pjekura ne HELL”, what a great sign, my Shqip-lish (Shqip=Albanian/English) finds this pretty entertaining. Before you worry that the poor chickens are being succombed to a torturous un-godly treatment, it means “Skewered baked chicken”, Hell= skewer. This blogger enjoying some chicken straight off the hell.